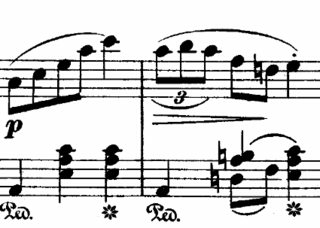 I was wondering about triplets : when and where were they used for the first time in scores? More generally, when were triplets used significantly (i.e. not one single time on one particular score, but used several times by many composers)? According to Oxford Music Online, « the slur and figure used in this way do occur in the 16th century, but were not common until the 19th ». I've never seen a baroque piece using triplets (I don't know many compositions from this epoque, though). On the contrary, tuplets are more frequet in Chopin's works, for instance. I'm interested in any relevant piece of information. Thank you in advance! Mensural music was ambiguous about whether there were two or three notes to one division. So triplets clearly were already part of the music then even though notation did not distinguish them. In Baroque music, the subdivisions were already smaller and triplets typically indicated by beaming (or brackets). I think the italic 3 is a later convention. Not the answer you're looking for? Browse other questions tagged rhythm history tuplet or ask your own question.